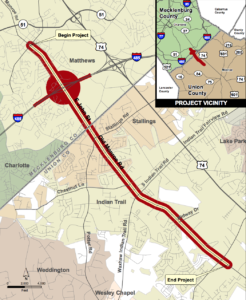 East John Street & Old Monroe Road Widening – The Moser Group Inc.
Planning and development are underway to widen approximately 6.5 miles of East John Street and Old Monroe Road – from Trade Street to Wesley Chapel-Stouts Road – in the towns of Matthews, Stallings and Indian Trail. Proposed work would improve traffic flow, reduce travel delays and allow for more vehicles to travel in the area. Bicyclists and pedestrians would also have accommodations along the project corridor.